All material excerpted from: Blumenkrantz, D.G. & the ROPE® Community (2015). The Rite Of Passage Experience© ROPE® Guide for Promoting Youth & Community Maturation & Health, 5th edition. In the early 1990’s David Blumenkrantz was associated with the Search Institute, a Co-Founder of the Connecticut Asset Network and assisted with the national role out of Developmental Assets and other strength based approaches to youth development. More often than not when people were first approached with the concept of developmental assets they thought we were talking about financial planning. After decades of working from a deficit orientation, where the focus was on fixing problems it took many years for people to accept, understand and put into practice strength based approaches. It’s the same with youth and community development through rites of passage. How can people be ready for something they probably never thought about, nor knew they actually needed? Through birth or marriage ceremonies and funeral rituals everyone knows about and has had direct experiences with rites of passage whether they knew its name or not. Assessing readiness includes informing citizens, youth and adults about the history of rites of passage, their essential ingredients and engaging people in conversations about how initiation and rites of passage are so important and the consequences of their absence. can we hope to change the story and transform the future. Identify what the issue(s) are and how they are related to youth & community development through rites of passage. Brings people together in sharing their own “coming of age” stories and increase people’s engagement in the process. Expands people’s understanding of the key concepts and language in youth and community development through rites of passage. Nurtures the integration of community’s culture, resources and levels of readiness among and between diverse constituency groups. 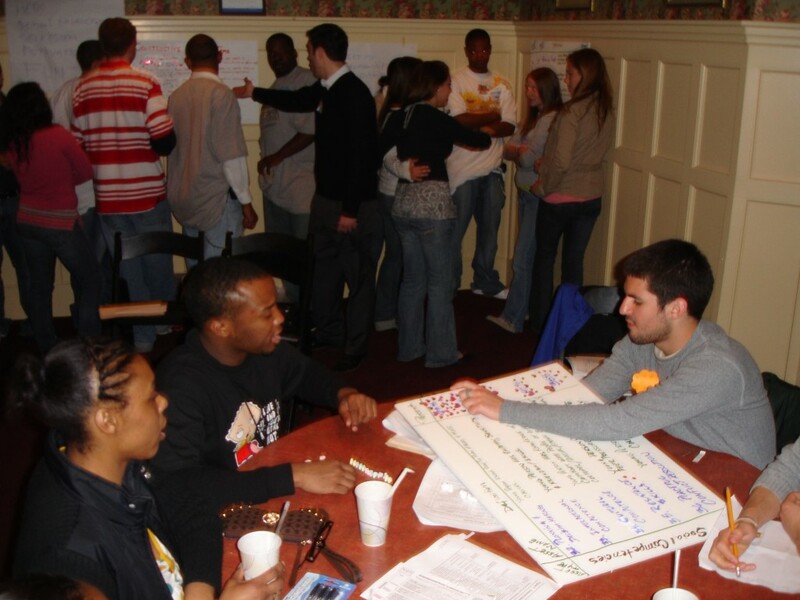 Begins a process for providing ongoing feedback and adaptation to the complex process of community change. >How do we get started? Youth & community development through rites of passage is a theory that has a number of scientific technologies which inform and guide practice. It is a dynamic integrative design process that has the potential to weave together all existing educational pedagogies and youth development designs. Through the common language and experience of initiation and rites of passage youth and adults have an ability to communicate at deeper levels and engage in more authentic ways of being human together. When practiced within a community the language of initiation and rites of passage forms a foundation to intervene with youth and their families should problems arise. It reframes therapy as part of the initiatory process where youth are co-researchers in a process of exploration. These techniques are sophisticated and elegantly woven seamlessly together to strengthen the fabric of community life. One of the first “technologies” we introduce is called the Trinity of Inquiry. It is a powerful process that uses the first three of the twenty elements in the architectural structure for youth & community development through rites of passage to guide conversations that explore contemporary issues in a community. It is also used to assess if and how all of the other seventeen elements are present and if they are present what is their relationship to each other and their relative strength? If they don’t exist where might something similar already be present and available to use in the process of building a community’s rite of passage experience process? What would we be doing when we adopt the framework of youth & community development through rites of passage in our community? When we get our story wrong we get our future wrong. When we get the story of educating and helping our children come of age wrong, we indeed get our future wrong. Look at what is going on in the world today. Might that be a result of getting the story of educating and helping our children come of age wrong over the past generation(s)? Asset mapping is a process that inventories the assets, capacities, resources and connections within a particular geographic area. It offers descriptive information that helps people carry out their specific plan. The Asset Based Community Development Institute where Jody Kretzmann and John McKnight helped to “birth” asset mapping is a main contributor and “thought partners” of the movement that considers local assets as the primary building blocks of sustainable community development. As the Co-Founder of the Connecticut Assets Network Dr. Blumenkrantz worked with both Jody and John who believed that primary materials for the formulation of initiation and rites of passage were within us. They were our individual – local assets – which were brought to life and practice through conversations that generates a collective community story. Communities have everything they need to raise their children. They have adults and opportunities for children to immerse themselves in educational, recreational, spiritual, ancestral, economic and natural environments. Making meaningful connections between youth and these environments is the key to the construction of contemporary rites of passage. Rites of passage can be the vehicle to make these connections meaningful for both children and the community. Asset mapping for community rites of passage is a technology that help us know where resources exists, or need to be developed in order to begin the process of designing a community’s rite of passage experience. Once we identify the presence, strengthen and location of existing resources and assets related to a community-oriented rite of passage we want to strengthen their relationship and link them a common story that engages the whole system. Identify how to influence each target group and nurture the conditions that strengthen and link each of the essential elements in youth & community development through rites of passage. These are only a few of the technologies used to enact the “Vision” for youth and community development through rites of passage.